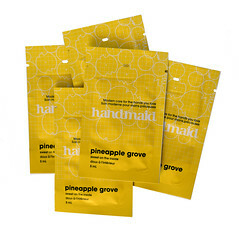 Over the next few weeks we are running a knit-a-long for the four patterns in our Soakboxes. We will be posting detailed information on each of the patterns as well as fun things you can do with your Soakboxes for yourself, as a gift and as a group. You can order a kit from us directly, just click on the link on the right, or you can ask for it by name from your local yarn store. May your hands be soft, fibers fresh and nails match your knits! 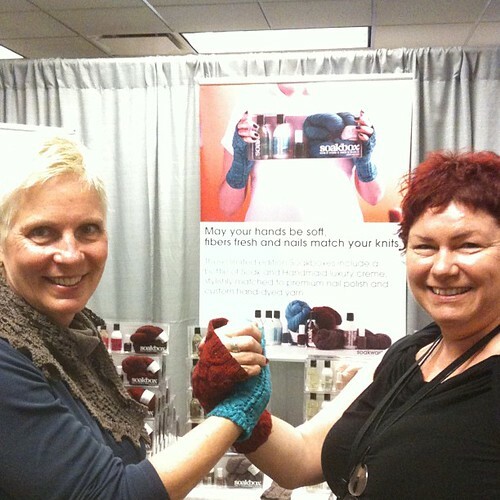 We just got back safely from Vogue Knitting Live Chicago, what a blast! Jacqueline and Chris’ flight was delayed by a day, but it was better than flying into the crazy wind we had here in Toronto that Monday night! Luckily they had Beth around to host them while they waited for the hurricane to settle down. We had so much fun talking to people about Soakboxes in our booth. Beth of Lorna’s Laces and Fiona Ellis came by a couple of times over the weekend to chat to customers and sign patterns. One fun part of the weekend was being able to wear the samples. We had a little manicure party before the show started so that everyone would be in the Soakbox spirit. We had one of each colour on display! Thank-you again for stopping by our booths at Rhinebeck and VKL Chicago. 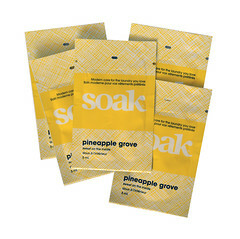 We can’t wait to see the Soakboxes knitted up and hear about what you are washing with Soak. Let us know in the comments!